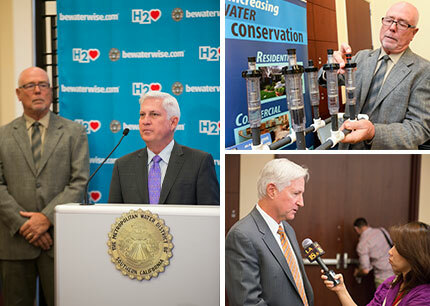 From top right, clockwise: Board Chair Randy Record showing a water savings device (photo by: SGV Tribune), California Department of Water Resources Director Mark Cowin speaking with a reporter, and General Manager Jeff Kightlinger addressing media. As a sixth year of drought looms, Metropolitan plans to meet the region's 2017 imported water needs. Mark Cowin, director of the California Department of Water Resources, joined Metropolitan board Chairman Randy Record and General Manager Jeff Kightlinger at a well-attended news conference to update the public on water supply conditions and drive home the importance of continued conservation. Read the press release and news media coverage: L.A. Times, San Gabriel Valley Tribune. Metropolitan board Chairman Randy Record is elected to a second term as the leader of Metropolitan's 38-member board of directors. Read the press release and watch footage from the meeting. Long Beach water commissioner Gloria Cordero, right, was seated in September as the city's representative on the board of directors of Metropolitan. In October, Elsa Saxod, left, former director of Binational Affairs for the city of San Diego, was seated on the board. Read the press release on Cordero and Saxod. 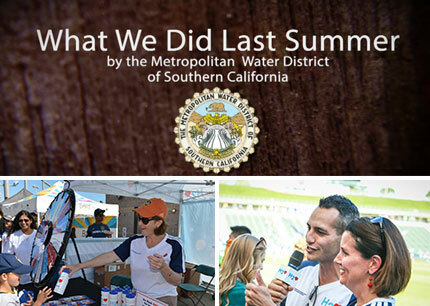 Metropolitan and the L.A. Galaxy teamed up as part of MWD's water-saving outreach campaign. Galaxy fans were treated to H2Love conservation messages and tips during home games. The partnership also included Metropolitan teaming up with the Galaxy on its "Protect the Pitch" program, which supports local environmental and community projects. Watch a short video about the partnership. The Association of California Water Agencies, the state of California's Save Our Water program and Metropolitan are sponsoring a four-week run of water-saving videos on TV weather broadcasts throughout Southern California. Watch the TV spots: Thank You California, Fix Leaks and Landscape. From left to right: Sue Sims, Jon Lambeck, Gordon Johnson, Michael Rojas, Nola Hastings from The Climate Registry, Ha Nguyen, and Warren Teitz. The international non-profit group recognized Metropolitan as a Climate Leader by awarding it Climate Registered status. The recognition is given to The Climate Registry members that go beyond measuring, reporting and verifying their corporate carbon footprint to managing and reducing emissions. Tidal Wetlands Restoration Project Moves Ahead in the Sacramento-San Joaquin Delta. Read the new fact sheets: Colorado River, California Water Map and Proposed Regional Recycling Project.